Originally designed by Christopher Hannan for an Idaho scout troop, the Skeletek Bushcraft is a remarkably balanced outdoor knife. 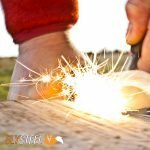 The Skeletek Bushcraft is a great addition to any backpacker, outdoor enthusiast, and lends itself well to hunting, camping and survival scenarios. Initially designed for an Idaho scout troop by Christopher Hannan, the Skeletek Bushcraft is a remarkably balanced outdoor knife. 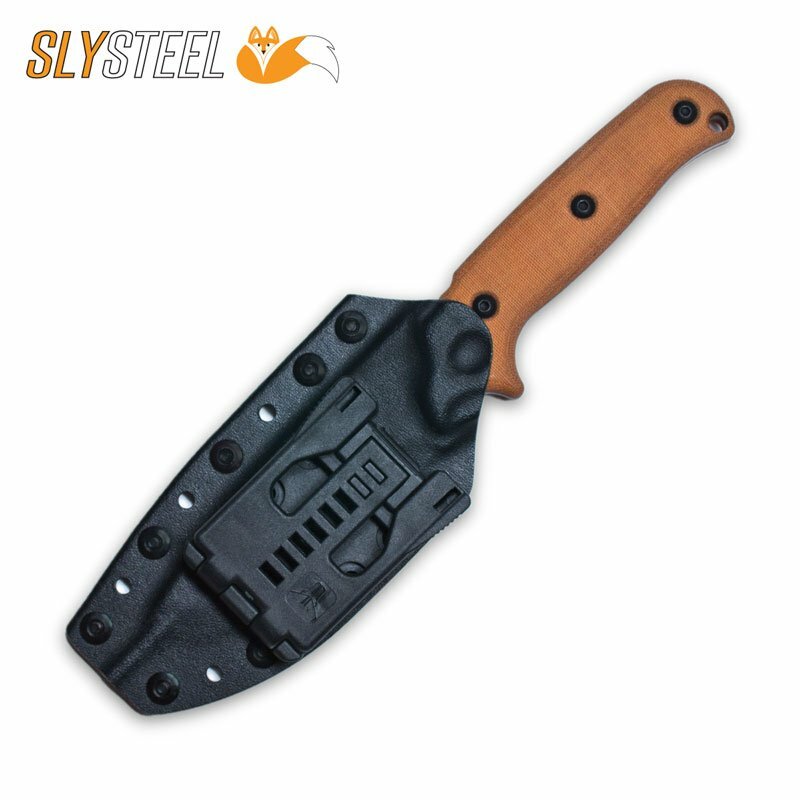 While designed specifically for the backpacking and outdoor community, the design lends itself well to hunting, camping and survival scenarios. 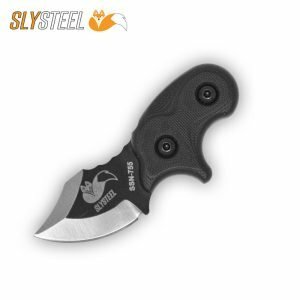 The knife follows the same design principles as other SLYSTEEL knives. As a result, the Skeletek Bushcraft preserves the versatility, ergonomics, and retention that our customers have come to expect from our unique knives. 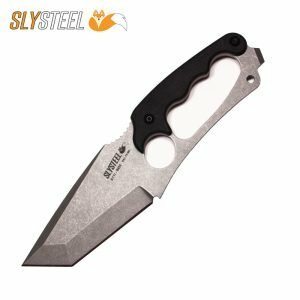 Boasting a larger blade width than most knives in its’ class, the Skeletek Bushcraft has more steel where it matters most. The blade is hand finished with a modified scandi grind. The drop point design has a belly deeper than most making it an excellent hunting and skinning option. The thick spine can be batoned on for splitting wood, crushing bone, and cutting tendons. Another result, is the tip is less pointed and has increased toughness for light prying. Additionally, the flatter tip allows the user to carve material easily by pushing the knife from the pommel. 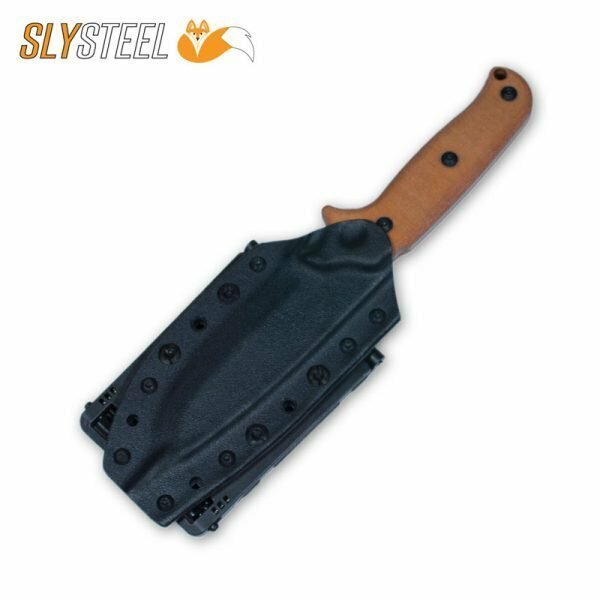 The handle on the Skeletek Bushcraft was designed from the ground up to be as comfortable as possible while maintaining hand retention regardless of user grip and orientation. The knife can be held in a traditional power grip with the thumb resting on the soft jimping for most tasks. However, the finger choil will allow the user to choke up one or two fingers for finer work that might otherwise require a shorter blade. The choil also reduces the risk of slipping forward and cutting the hand. Additionally, the handle is designed to be choked down on for more length and better chopping power. A thumb and two or three fingers is all that is needed for chopping. For even greater retention in this position, the quarter inch hole in the pommel can be used with a lanyard around the wrist. The zone hardened spine features an ambidextrous ferro rod striker. This distinctive feature assists the user in producing long controlled strikes down the length of a ferro rod. With a rod resting diagonally on a stable surface below the tinder, a downward striking motion is both natural and repeatable. Striking in rapid succession or striking slowly for more precision is intuitive. Additionally, the striker can also be used to shave magnesium tinder. One reason the Skeletek Bushcraft is so well balanced is because of the skeletonized handle. 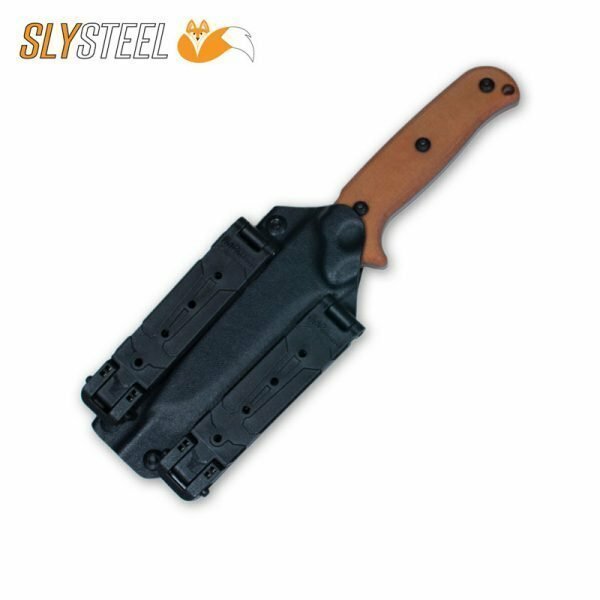 The greater than normal blade width increases the forward weight of the knife. However, the hidden cutouts give the knife better weight symmetry without sacrificing handle strength. Once the micarta handles are removed the revealed cutouts allow additional versatility. For instance, the handle can be wrapped in paracord for a custom contoured grip. Or it can be lashed to a spear shaft for heavy chopping, hunting or self-defense. Included in the micarta handle is an ambidextrous spindle divot. Our divot is purposely placed forward over the finger choil. Doing so uniquely separates the index and second fingers away from a moving spindle. The knife is also purposely balanced over the finger choil. This allows the user to focus more on bow and drill fire starting and less on balancing the weight of the blade. Alternatively, the user can hold the knife in a reverse grip, parallel to their forearm. As an added bonus, the micarta handle divot will get harder, smoother and yield less friction over time. I get the chance to test and review a lot of knives on my Youtube channel. 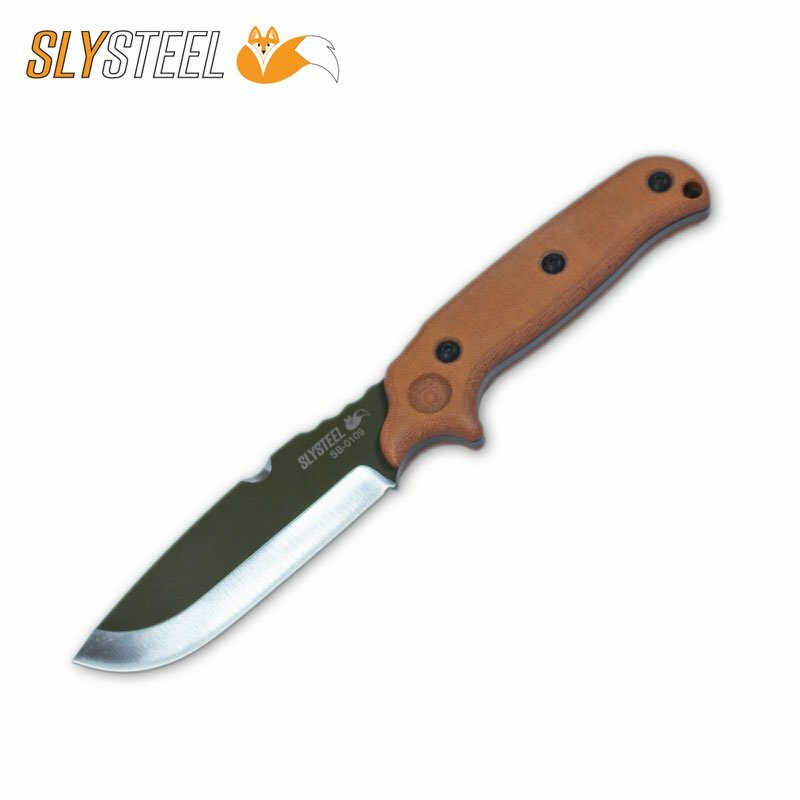 The Skeletek Bushcraft knife is a well thought out design. I have no doubt that it would perform and give you many years of use and memories. 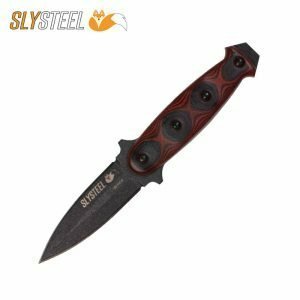 The Skeletek Bushcraft is a great addition to any backpacker, or outdoor enthusiasts. It lends itself well to hunting, camping and survival scenarios. The blade is hand finished with a modified scandi grind. The drop point design has a belly deeper than most knives making it an excellent hunting and skinning option. The thick spine can be for batoning to split wood, crushing bone, and cutting tendons. The zone hardened spine features an ambidextrous ferro rod striker. This distinctive feature assists the user in producing long controlled strikes down the length of a ferro rod. Included in the micarta handle is an ambidextrous spindle divot. The divot is purposely placed forward over the finger choil. Doing so, uniquely separates the index and second fingers away from a moving spindle. The knife is also purposely balanced over the finger choil. This allows the user to focus more on bow and drill fire starting and less on balancing the weight of the blade. 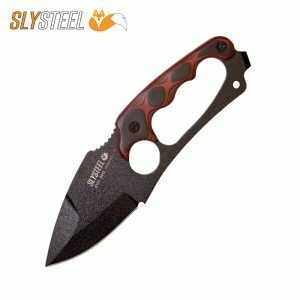 Finally, after using the Skeletek Bushcraft knife, it is now my preferred primary knife for my Bug Out Bag or any outdoor activities. This knife is the real deal and will definitely get any task done with ease. Great job on this knife design. I love it!!! I own lots of knives and this Bushcraft is the one that beats all!! It is so versatile that you could use it for not only hunting and camping, but for EDC! I love it so much, I bought 3 more! You should definitely pick one up if don’t have one already! As knife reviewer and avid outdoorswoman, I can say that I am extremely pleased with this blade. 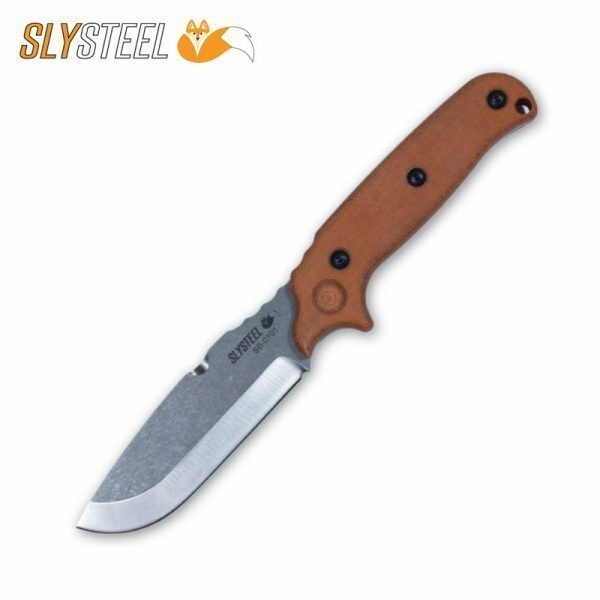 It has all the features you could want for a bushcraft blade and a multipurpose blade shape, and handle grip. This was designed with thought and consideration for anyone who is out in the bush. I feel like this knife could go through a lot! This is the blade I used for a 40-day survival challenge on Naked and Afraid XL: ALL-STARS. It was the perfect size, not too big not too small, and was by far the most-borrowed of all the blades out there. It was perfect for skinning/preparing animals, scaling/gutting fish, crafting bushcraft materials, and even extracting deeply-imbedded thorns from feet! I love the Skeletek Bushcraft Blade and will carry it with me on many adventures to come.